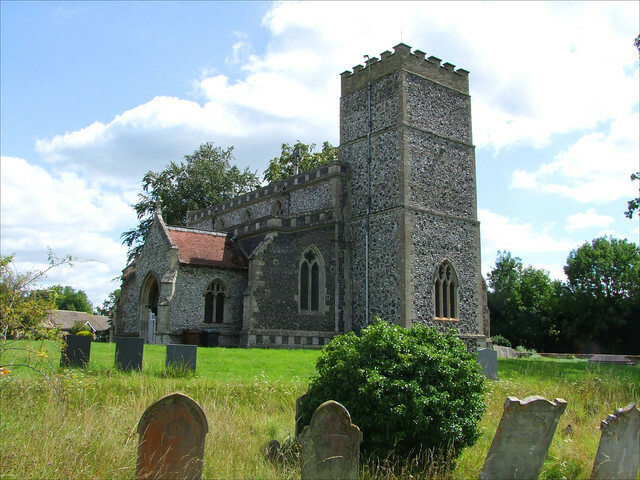 The village of Icklingham is home to one of the loveliest churches in Suffolk. Unfortunately, it isn't this one, although St James would look rather better without the inevitable comparison. The Churches Conservation Trust now cares for beautiful All Saints at the other end of the village, and Parish life now revolves around this smaller, heavily Victorianised church, which stands beside the massive flour mills. Icklingham is named for Boudicca's Iceni tribe, and was later probably the largest settlement in the most densely populated part of Saxon England. This may explain why it retained two parishes, and it is still a busy little place today, stretching along the hectic Bury to Mildenhall road. Like many Suffolk churches, St James was very neglected in the 18th century, and the tower collapsed. This was rebuilt quite early on in the 19th century, according to Mortlock. It was certainly in place by the time the church was sketched in the 1820s. Seeing the building from the outside, you might think the rest of it entirely the work of the 1860s; in fact, the nave and chancel were refaced in flint and reroofed, as at Campsea Ash, and still retain much of their 13th and 14th century substance. You step into a church where the hand of the Victorians fell so hard that for a moment you might think yourself transported back to the 1860s. The overwhelming feeling is one of clutter, of the busy confidence of that decade and the four which followed it. Now, I happen to like this sense of the Church of England at the height of its powers. It was also the time of the height of Empire, and you will find interiors like that of St James all over the world, wherever Anglicanism's influence reached. We could be in suburban Melbourne, or Buenos Aires, or Calcutta. This is a place where there was no shortage of money to make the church look 'nice', from the furnishings to the stone reredos, from the Biblical quotes above the doors to the tiled sanctuary, from the Gibbs memorial to the elaborate acreage of the stained glass the family paid for. There is a comfort to this clutter, a sense of patronage, duty and determination. Did the parish choose the wrong church? Visiting both of them, and admiring the quiet, rustic interior up the road at All Saints, you can't help but think so. The overwhelmingly old-fashioned interior of St James might have seemed the very thing in the 1970s, but it is hard to see how it will be easy to adapt it to the changing liturgical needs of the 21st century. The wide open spaces up the road might have been more appropriate. But this is a small parish, and All Saints required such a lot of repair work that redundancy was really the only option. We are entering a time when the Church of England's stewardship of this country's medieval heritage will seem an absurd thing, an anachronism. This village may well be used as an example.